Easter in the snack world means one thing - chocolate! As I'm not a massive fan of chocolate I still have Easter products left from previous years, I enjoy it but only when I'm in the right mood. Here are the most Eastery chocolate things I have consumed recently. 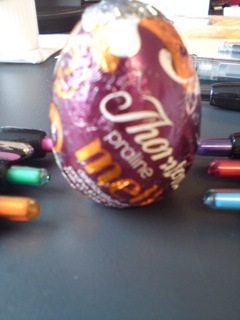 This tiny thing, about the size of a Cadbury Creme Egg (pens included for scale, but focusing wasn't really working) is a very edible little treat. Usually these eggs are full of something heavy like caramel or the Creme Egg itself and while a pleasure to eat one is more than enough. This however is a feather-light treat, and as the runny centre is best consumed quickly to avoid spillage one that is over all too quickly. The combination of the quality chocolate & praline is a taste explosion I could have happily eaten two or maybe three of these in one sitting. As it was a gift I'm not sure how expensive these are, but I think I'll be checking for post Easter sales on these. I enjoy Cadbury's chocolate but I'd never just buy a bar of Dairy Milk to eat. I have a few cubes here and there of other peoples, and the little Celebrations size versions are more the correct portion size for biscuit loving me. This however is something I'd be tempted to pick up. I think this was a gift (it's chocolate so it's likely) probably from Cyber Candy or similar as this isn't a high-street brand and I've not heard of 'clinkers' before. The multicoloured candy within this bar is fruit flavoured but not sour like the equivalent UK candy of Nerds which is at first underwhelming, but actually works as a nice edge to the chocolate. This combination of fruit and soft, melty Cadbury's chocolate caused me to eat the bar in two sittings - and I have over 10 choc bars in various stages of consumption that I've had for much longer. If this was available in newsagents I'd love a 40-50g bar for a single portion of out and about chomping. I can take no credit for this one - it's made by my cousin (@xCuteKrazyKayx on Twitter) for her niece's first birthday party. While I didn't actually get chance to eat any of this I thought the use of the stylish Maltesers Bunny and (I'm only 90% sure this is) the Cadbury Caramel Bunny as a simple but effective Easter style cake was too good to not mention. White mice are always a nice touch too. Anyone looking for an Easter cake could probably find all the bits for this long after the pre-made Easter cakes are gone from the supermarket and for a more reasonable price. Anyway - have a fantastically fab Easter and now I have to try and eat all the chocolate before the next one rolls around! Aw love the look of the Malteaster bunny cake it looks tasty! 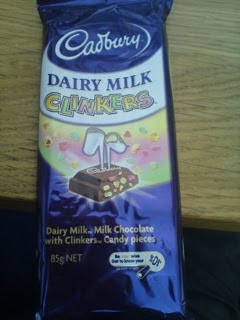 The clinkers bar is Australian :D There's also a version of that range which is popping candy in Cadbury chocolate. They're quite hard to find, even in Australia, so I'm amazed they turned up in England. Cool - glad I got to try one that was a bit special then Nic! Shame I'll probably never have a 2nd one, maybe I should get my Spots Vs Stripes guy on the case and get them to do a UK style one. 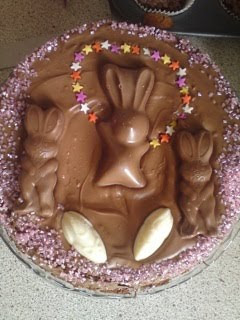 Malteesers bunnies are weird but yummy and that cake looks awesome! I love this cake! Especially as lately I've had a bit of craving for these Maltesers Teasers/Bunnies chocolates! I generally enjoy them much more than cadbury's I must say. Although I've always kinda had to be in the mood for cadbury's.